I'm heading to the lake with my family later today and I was tasked with bringing the "treats." Do I go with the classic Perfect CCC's? I could. Do I take the easy way out and just buy s'more ingredients? No, because it's 100+ in Oklahoma right now and the last thing I want to do is stand around a fire. So instead, I will combine the two. As if my Perfect CCC's and a s'more had a baby, I give you Campfire Cookies. The ultimate summer lake trip treat. 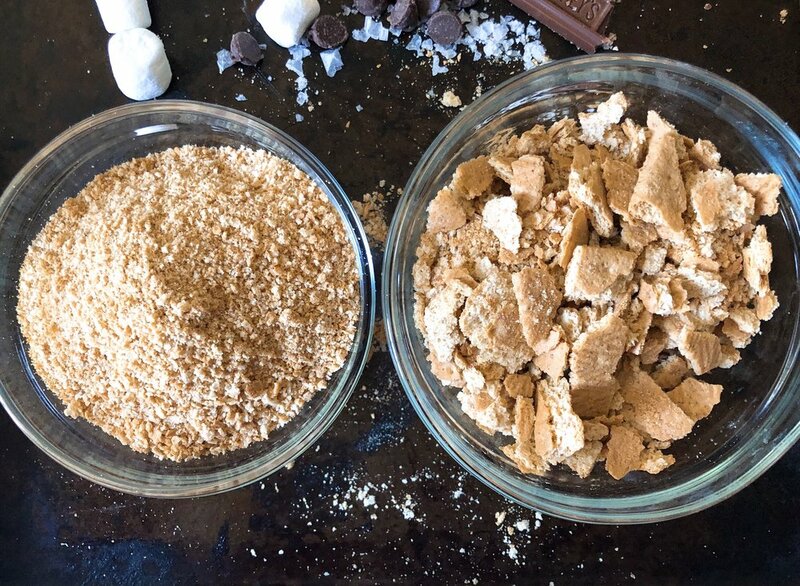 They are everything you love in a Perfect CCC (hello flaky Maldon Salt) mixed with graham crackers, marshmallows, and a Hershey's chocolate bar. I can think of nothing better right now. I will also take this moment to profess my love affair with Graham Crackers. The most underrated cookie/cracker. They are the perfect after dinner snack. Shmear on a little Cookie Butter or almond butter and you are golden. Graham Crackers I love you. Campfire Cookies, I love you too! Divide your graham crackers into stacks of 4 and 5. Take the 5 graham crackers and place in a large ziplock bag. Using a rolling pin crush the crackers into fine crumbs. This mixture will be added to the dry ingredients, so you want them to be very fine. Pour into a bowl and set aside. Then, take the 4 graham crackers and break them up into small pieces. Small enough to be mixed into the dough, but still in chunks. *see photo above for reference. In a medium bowl, whisk together the flour, fine graham cracker crumbs, baking powder, baking soda, and salt. Set aside. In a large bowl mix both sugars. *You can use light or dark brown sugar. I like a dark cookie so I prefer dark brown sugar, but I switch off depending on what I have on hand. Pour the melted butter into the bowl with the sugars and whisk until smooth. Add the eggs, one at a time, whisking to combine. Stir in the vanilla. Slowly add the dry ingredients into the butter-sugar mixture. I found a wooden spoon to be the easiest for this job. Once the dough has almost come together, add the chocolate chips, marshmallows, graham cracker chunks and 3/4 of the chopped Hershey's bar. 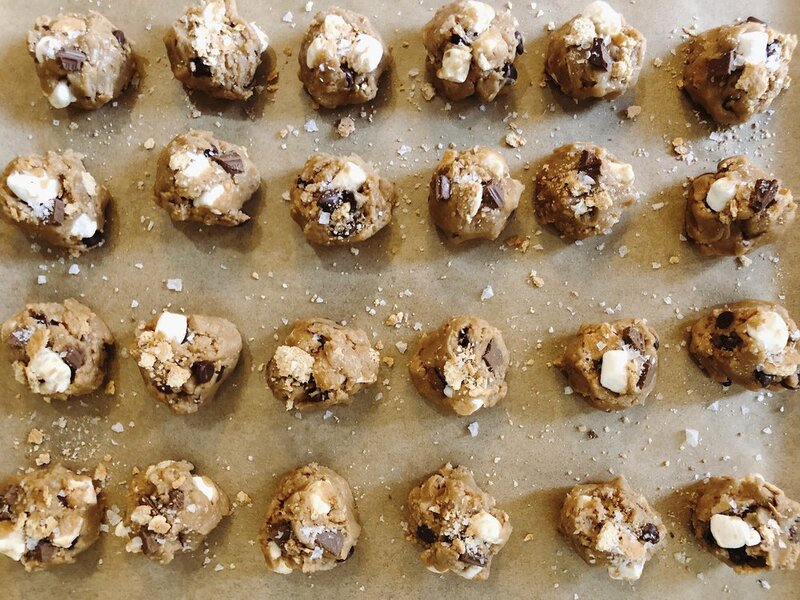 Reserve a few marshmallows, graham cracker chunks and 1/4 of the chopped Hershey bar for topping the balls of cookie dough. Form 2-3 tablespoon size balls. I used a standard size cookie scoop, but overload the scoop getting a larger ball of dough. Place them on a cookie sheet about 2 inches apart. Do not overcrowd the pans. I got 10 balls of dough on a pan. Take your reserved chocolate, graham crackers, and marshmallows and top each ball of dough with a little of each. Then sprinkle the top of each cookie with flaky Maldon salt. Bake for 9-11 minutes, rotating the pan around halfway through. Bake until just slightly golden. Don't fear, the marshmallows will ooze out and go all over the pan. For a prettier cookie, take the cookies while they are still warm and using either you fingers or a knife, pull off and trim away the oozy marshmallow.You are simply just cleaning up your cookies.